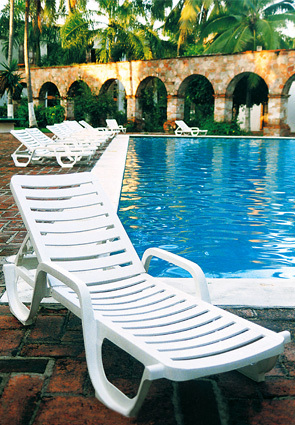 The Bahia chaise lounge chair will grace your pool area for many seasons. Extra reinforced slats and frame provide maximum support. 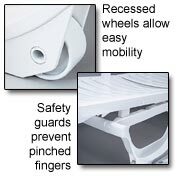 Recessed roll away wheels and longer sleigh glides prevent accidental front tilt. Adjustable back bar allows the backrest to lay flat or sit at various angles for personalized comfort. Rated to 300 lbs. and tested in compliance with ASTM F1988-99. Constructed with high strength branded textilene fabric, specifically woven to meet ASTM standards for colorfastness, mildew resistance, resistance to soiling and wear and tear for many years in commercial outdoor environments Bahia Chaise Lounge Chairs and Cushions meet all American Casual Furniture Fabric Association (ACFFA) requirements. Lounge chair can be used with or without the chaise lounge cushions. To brighten up any environment, the optional hooded cushions are available in the solid colors shown below.